Small is significant. The small seed grows to a sizeable tree. Silently, imperceptibly, life breaks open the heart, and vines its way toward the light. 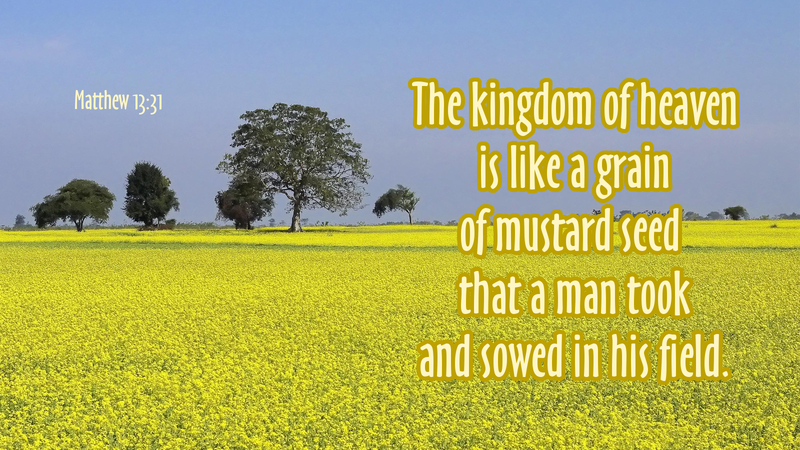 Such is the nature of the kingdom of heaven. Disciples of Jesus Christ carry the seed, spreading the Good Word over all the earth. Small acts of kindness, simple words of hope—planting these is the privilege. The ultimate purpose is not merely shady ground or even a perching place, but rather the glory of God. God tasks the faithful only with the sowing; his work is the growing. But the worm and the weed start small, too. Seemingly insignificant sins poison the soil and choke the bud. No amount of human effort can produce life, but effortless evil can stunt it. Following Jesus is a call to the straight and narrow. Living in the light means resisting the temptation to share in the sins of others. Christian living isn’t separatism, but it is separation from the company of wickedness. The Word of the Lord, the seed of salvation, is a life-giving word. Broadcast it. Nurture it wherever it grows. Prayer: Lord of life, today please grant me the privilege of going and sowing; and protect me from sin that would spoil the life you are giving me. Amen. Today’s devotion was written by Beverly DeBord, Associate Pastor at Grace Evangelical Lutheran Church, Springfield, OH.